Couldn't you find the answer? Please contact us, it will be our pleasure to help you! What does it take to cause an explosion? How did it come to the existing European ATEX Directive? What is the subject of EU Directive 1999/92/EC (ATEX 153)? What does Directive 2014/34/EU (ATEX 114) say? How is the marking of explosion safe equipment built-up? What is the connection between equipment groups, ATEX categories and the EPL? Which are the most frequently applied protection methods against ignition? How are gases and dusty substances divided into gas and dust groups? What temperature class do I need for my equipment? What is the maximum allowable surface temperature in a dusty environment? 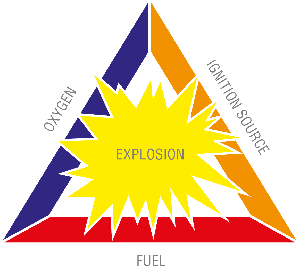 Explosions can be prevented by removing or suppressing one of these three elements. The presence of combustible substances is often inherent to the operational processes and cannot be prevented. Because in the majority of cases people are also present, it is impractical to remove the oxygen; after all, people need to breathe oxygen. The most practical and more or less the only method is to remove or eliminate the ignition sources. A combustible substance can only be ignited if it is present in the correct mix with oxygen. The Lower Explosion Level (LEL) and Upper Explosion Level (UEL) have been established for every combustible substance. Outside of these levels, the combustible substance cannot be ignited because the mix contains too little or too much of the substance. The "ignitability" of the mix describes a parabolic curve where precisely at the LEL or UEL points, the mix can just be ignited. The top of the parabola indicates the mix that is easiest to ignite and therefore the mix that only requires an extremely small amount of ignition energy to ignite. At this point, the highest explosion pressure occurs if the substance is ignited. A distinction can be made in the principles that can be employed in explosion protection. Here we distinguish three groups, namely, primary, secondary and tertiary explosion protection. Measures that prevent an explosive mix arising, for instance by ensuring that there is an overpressure of clean air or an inert gas in a cabinet. An explosive mix can still arise, but measures are taken to prevent the mix being ignited, for instance, by encapsulating the potential source of ignition or by limiting the electric potential to the source of ignition using Zener barriers. These are measures that are aimed at limiting the result of an explosion to an acceptable level. This can be accomplished by, for instance, employing rupture discs, flame arrestors and/or explosion hatches. In Europe, directives have been drawn up related to being able to work safely (ATEX 153) and the safe operation of supplied equipment (ATEX 114). In the early 90's, the Council of Europe decided that the probability of an explosion should be as small as possible or should at least lie within acceptable limits. To achieve this, provisions have been drawn up that relate to actions in the workplace and the safe operation of supplied equipment. These provisions have been laid down in two directives and the member states of the European Union have committed to transfer the rules in these directives into their national legislation. The European directives are therefore not directives for users or manufacturers but are intended to lay down the agreements between the Council and the national governments. The first directive is ATEX 153 (1999/92/EC) that records the minimum requirements for protecting the health and safety of employees who could run a risk due to explosive atmospheres. The objective of the minimum requirements laid down in the directive is to raise the level in the member states that are below this minimum. The member states that are already above the minimum level are not expected to lower their requirements to the minimum level. The ATEX 153 directive is also called the social or installation directive. In the Netherlands, this directive is embedded in the Working Conditions legislation and regulations. Furthermore, criteria are proposed for the selection of equipment in accordance with the risk assessment and as recorded in the Explosion Protection Document. Here, equipment must be selected based on the categories mentioned in the ATEX 114 directive in relation to the zone in which the equipment will be used (see table below). As a result, the relationship between ATEX 153 (Working Conditions) and ATEX 114 (Equipment) and therefore also between the zones and the categories has been specified. The second directive is ATEX 114 (2014/34/EU). This directive for "Equipment and protective systems, intended for use in potentially explosive atmospheres", describes how to arrive at the statutory CE marking for explosion safe equipment. This directive is intended for manufacturers to promote free trade within Europe and is therefore also called a product directive or manufacturer directive. In the Netherlands, this directive is included in the Commodities Act. Safety, control and regulation provisions intended for use outside of potentially explosive locations, but that are necessary for, or contribute to the safe operation of equipment and safety systems related to the explosion hazard. The field of application of ATEX 114 extends to places where under atmospheric conditions an explosive environment can arise in which the combustion after ignition propagates to the entire non-combusted mix. The ATEX directive does not apply to systems on-board sea vessels and mobile offshore systems, as these are already covered by the IMO (International Maritime Organisation) treaty. The data concerning the electrical connections and any non-conforming ambient temperatures, etc. will be shown as far as possible on the type plate. The majority of the aspects speak for themselves, however the Ex Marking requires further explanation. The various elements of the Ex Marking are explained based on an example. The various elements are explained below. At the highest level, a distinction is made between two equipment groups where Equipment Group 1 concerns all underground (mining) systems and Equipment Group II all other surface (industrial) systems. The special treatment of equipment for underground systems relates closely to the extremely specific circumstances that need to be taken into account in mining operations. Rock that is rich in coal also contains methane and this gas is therefore omnipresent. Moreover, the risks underground are by definition high (long narrow tunnels, threat of collapse). Based on the zone in which the equipment will be used, the user determines in which category the equipment must fall. This means that he is certain of the correct protection level. In fact, the manufacturer of the equipment must determine which method to protect against ignition will achieve this level. There are many protection methods possible. The most frequently used methods of protection against ignition are explained here. A flameproof enclosure may contain components which could ignite an explosive gas mixture during normal usage, due to sparks, arcs or high temperatures. A flameproof enclosure can breathe and the explosive gas mixture can therefore be present in the flameproof enclosure. The construction however is such that an explosion within the enclosure will not be transmitted to the outer atmosphere: the dynamic explosion pressure that occurs can be contained and the built-up explosion pressure will be discharged via the joint faces. The flame then cools down to below the ignition temperature of the ambient gas. A pressurized enclosure may theoretically contain components which could ignite an explosive gas mixture during normal usage, due to sparks, arcs or high temperatures. In practise, this applies only in relation to the models classified as Ex px (zone 1) and Ex pz (zone 2). With the Ex p protection method, the ambient explosive gas atmosphere cannot penetrate the enclosure because this is kept under the excess pressure by a protective gas. The protective gas may be an inert gas or clean dry instrument air. This means of protection is independent of the gas group. Electrical equipment that is constructed on the basis of the Ex e means of protection against ignition must not contain any components which could ignite an explosive gas mixture during normal usage. The explosive gas mixture may penetrate the electrical equipment. Ex e therefore provides a means of protection which will only work with standard non-sparking equipment. To render a circuit intrinsically safe, the energy content of the circuit must be limited in a way that sparks or thermal effects cannot lead to the ignition of an explosive gas mixture. The energy limitation of intrinsically safe circuits is realised by limiting both the voltage (U) and the current (I). The construction requirements for limiting the energy apply both in regard to the intrinsically safe circuit and to the cables and associated components that are placed outside the danger area because parasitic capacitances (C) and self-induction (L) of for example long cables could play a role. Electrical components which could ignite an ambient atmosphere due to sparks or warming up can be rendered explosion safe by ensuring they are fully encapsulated in a moulding material. The moulding material must be electrically, thermally, mechanically and chemically durable. The effect of this classification can mainly be found in the permitted gap widths between parts of a pressure proof cover (MESG = Maximum Experimental Safety Gap) and the permitted energy for intrinsically safe circuits. Every combustible substance - air mix has its own specific ignition temperature. This ignition temperature is defined as the minimum temperature at which the mix can be ignited. This can be the temperature of a hot object such as a heating element, electric motor, light bulb or an overheated mechanical drive. For mixes of various gases or dusts, the gas or dust having the lowest ignition temperature determines the ignition temperature, unless additional details prove differently. To prevent ignition, the highest prevailing surface temperature must therefore be lower than the ignition temperature of the combustible substance - air mix. Gas explosion-proof equipment is classified in temperature classes or "T classes". Equipment that is classified in a certain temperature class can be used for gases with an ignition temperature that is higher than the temperature associated with the group. Dust explosion-proof equipment is not classified in temperature classes but for these the maximum surface temperature is stated (obligatorily) on the label or text plate of the equipment. The lowest value is the determining factor and therefore the maximum permitted surface temperature for dust from sanding wood is 235 °C. Note: The smoulder temperature applies to a 5 mm thick dust layer. For thicker layers, the specified margin of 75 °C must be increased.